Unmissable historic, entertaining, dramatic and scenic places to visit in Scotland on and off the beaten track - this is your essential checklist of must sees. Includes Glenfinnan, Culloden, as well as a few surprises. We list our favourites amongst the Scottish places we know you’ll love. What places to visit in Scotland are really ‘must sees’ if you are planning your vacation here? Well, obviously, it all depends on your interests. One visitor’s fascinating Scottish castle is another’s tedious and dusty old ruin. Here is a really useful list of our favourite places to visit in Scotland but in specific categories. It's a long page - so keep reading - you'll be glad you did! You’ll find lots more touring ideas on other pages on this site too. So it took a blockbuster novel by Dan Brown to catapult this interesting but sleepy little religious site on the edge of Edinburgh into a kind of must see with soaring visitor numbers and a new visitor centre. But Rosslyn Chapel is a most interesting place for all that. They offer visitors an excellent guided tour plus the cafe does a mean hot chocolate! Because you can take it for granted you should probably take in Edinburgh’s National Museum of Scotland, this is a reminder that the ambience in Glasgow’s Kelvingrove Art Gallery and Museum is a little different, possibly even friendlier. Plus it has one of Europe's great art collections. There are over 8000 objects across 22 galleries! And, it's free - as well as being one of the most visited museums in the UK outside of London. Definitely worth a look amongst the other Glasgow (nearly) must sees. 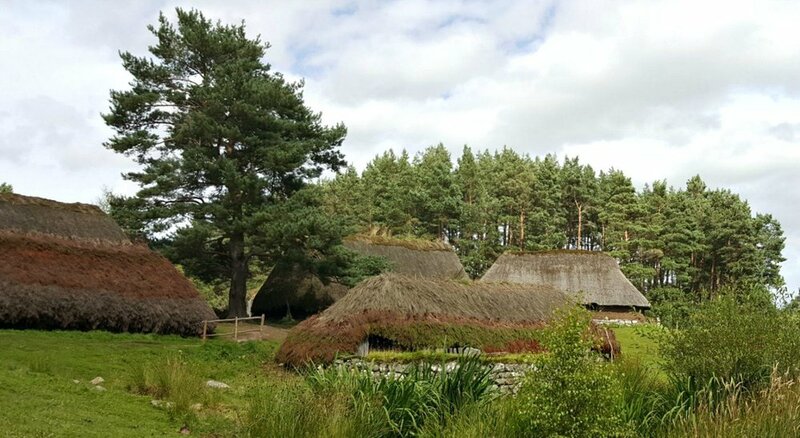 Our verdict is that this is just about the most illuminating and fascinating museum anywhere in Scotland - an immersive and realistic experience evoking what life was really like in the Highlands. (By the way - life was miserable - some of the time!) This was Britain's first open air museum. A total must see if you are on the A9 road near Newtonmore. Oh - and it is free entry! Dominating the town skyline, the old lighthouse in Fraserburgh was first lit in 1787. It now forms part of the Museum of Scottish Lighthouses. And, yes, you get to go to the top of it. A whole lot more interesting than it at first sounds - this is the real deal - not just a collection of lighthouse artefacts, amazing lenses etc, but a tour of a real historic lighthouse, originally built up through the middle of an equally real 16th-century tower house (castle). And, wait, there’s more - this also qualifies as off the beaten track. Take in the Loch of Strathbeg (see our wildlife page) as well, if you are of the slightest birdy inclination. No, it wasn’t Scotland versus England in 1746 - far from it - but it was the last battle in a civil war that was fought on Scottish soil. Learn all about it at this vivid evocation just a few minutes by road from Inverness. Walk the battlefield, enjoy the vivid audio/visual experience, see demonstrations and maybe if you are lucky you will be picked to demonstrate how to fire a musket. It’s not loaded, by the way. This is everything a historic visitor centre should be - plus there is a nice self-service cafe and a well-stocked gift shop with an excellent book section. And what was Bonnie Prince Charlie thinking about? Delusional, methinks. A great walk to a half-forgotten bridge that saw the first military action from Bonnie Prince Charlie's supporters in the 1745 rebellion. Dunadd near Crinan - ancient crowning place of Scots kings. There's a rock cut basin and a footprint, perhaps part of early ceremonies, and the site is close to all kinds of other prehistory. Fine setting in the heartland of Argyll. Can be a bit of midge paradise. Consider some anti-insect protection. Glenfinnan on the Road to the Isles - the road linking Fort William and Mallaig - has a famous viaduct, the 'Harry Potter bridge' - and Bonnie Prince Charlie's Monument nearby. Advice on the best viaduct viewpoint here, plus walks, loch cruising. It's beautiful country - a Highland 'must-see' . But the Glenfinnan Monument marks where our delusional chum Prince Charles Edward Stuart (aka Bonnie Prince Charlie) unfurled his flag and rallied (a few of) the clans in 1745. The figure on top of the monument is, apparently, not meant to be the prince, just a generic Highlander. By 1815, when it was erected, the Jacobite myth-making machine was in full romantic cry. Were the Highland Clearances ethnic cleansing or did the landlords really think it was done for the good of the locals? An emotional topic still. (Above) - View towards the distant Eildon Hills from Hume Tower, Scottish Borders. The Eildon Hills are mandatory in any view of the Scottish Borders. Ho-hum. But the odd-looking tower - actually a kind of folly now - of Hume Tower is highly visible, say, from the A697, and is well worth a wee diversion, if the weather is looking clear. Hume Tower isn't in this scene, obviously, as I am standing on it. What is this mock-ramparted castle-thing doing on this list, the learned amongst you will ask? Well, we don’t care. We think it’s the one place - other than Smailholm Tower - where you really get that rolling, blue-hill, endless view that is the essence of the Scottish Borders. Yes, in the picture here of the mountain called Liathach, you spotted that I'd been messing about with those tempting PicMonkey special effects. That particular effect is probably not called 'make the top of mountains unnaturally blue'. The authentic part is the out-of-focus raindrops on the lens, right hand side. The famous song 'Why Does it Always Rain on Me' actually has an answer: it is 'because you're probably in Glen Torridon'. Isn't the mountain Liathach big though? Anyway, Sou’wester Ross, as we used to call it, is serious and austere. And lonely. And impressive. All that wild outdoorsy thing will make you think of that lovely hotel bed you will snuggle into later, perhaps. And I'm slightly ashamed of messing with the photo, so here's another picture of Glen (really Loch) Torridon - and it isn't raining. Loch Torridon panorama, with Beinn Alligin left and west end of Liathach on right. Glen Shiel - soaring hills on either side of the easy to drive road. Great area for hill walking. And, at the west end, it's a gateway to the island of Skye. Soaring mountains like Glen Torridon listed above, only slightly more alpine. At its best in late spring when there is still plenty of snow higher up. Makes the much hyped Great Glen look tame by comparison. Honestly, I’d rather drive through here any day than face that tedious road along the Caledonian Canal. Talking of driving - get some car rental quotes from these people - follow link - as they check out a whole variety of hire companies for the best deals. Upper Deeside, west of Braemar, Aberdeenshire. Lots of roadside stopping places to view the young and meandering River Dee. The National Trust for Scotland's Mar Lodge is hidden in the trees in the centre. And, if you travel to Scotland via the east coast (road or rail), then here's a town at the top of England we think you should visit too! Stay on the east side all the way to the Moray Firth and you might see our famous dolphins! Is Oban just a gateway to the islands of the west, or is it a destination in itself? Is it worth visiting? We say yes, for sure. But, beware, when you see these ferries heading into sunset, you may be tempted to extend your trip and jump aboard for the romantic Hebrides! Berwick-upon-Tweed is one of our favourite Scottish towns - except it isn’t in Scotland. (Though it has been in the distant past.) We love its unique historical features, including its notable town walls, plus it has a vibrant cultural life, interesting shops and places to eat. And the folk are friendly. It’s a Scottish must see, in England.